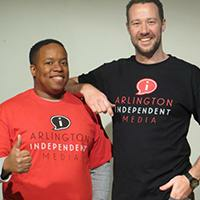 At Arlington Independent Media, we are committed to providing you with state-of-the-art equipment, facilities, and training at prices guaranteed to make participation possible for everyone. We want you to raise your voice right here at AIM, nine-time winner of the Overall Excellence in Public Access award. Help us fulfill our mission to advocate free speech through independent media by renewing or signing up below. I am joining on behalf of an organization. Show off your support for AIM with a T-shirt!